The question arises why banks are bailed out and not home owners directly. Bailing the latter out would also restore bank balance sheets. Moral hazard, you might say, but then what about banks? They did lent and a large part turned into non-performing loans. Should they be made whole? Should they expect to be? 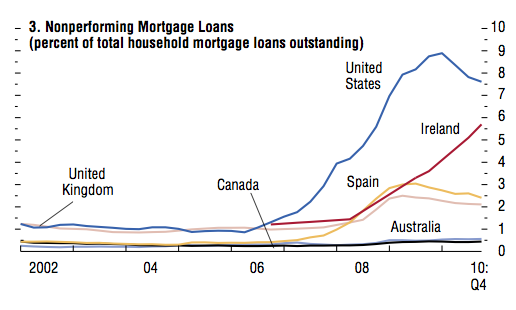 Reducing debt for home owners that are under water would be a strategy for Spain, too. Consumption there has been severely restrained by the households spending less and saving more. If the banks are saved, with the same money the house owners could be saved. It would be the same as “saving Greece” in order to save the European banks exposed to the country. Why not do it on the household level? After all, the people who bought in paid prices that were much higher than today’s prices. Even with a reduction of their mortgage debt they would probably not be better off than before buying a house. If that would be a touchy issue, policy can be designed so that nobody will benefit from a bail-out of home owners in the sense that they are better off than before. 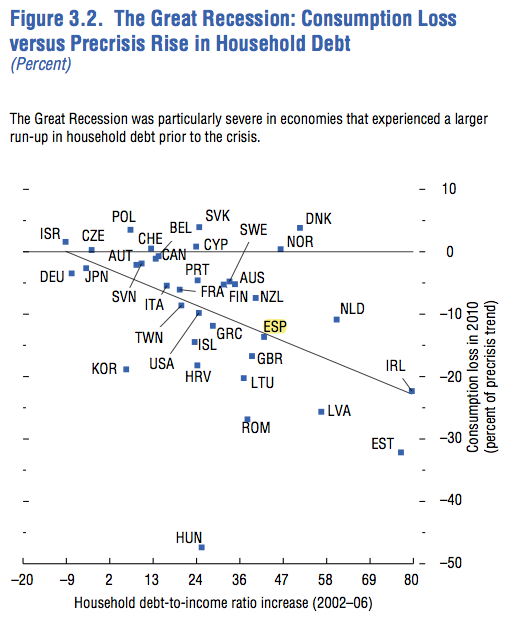 « Expansionary fiscal policy increases the real interest rate and crowds out private investment – really?